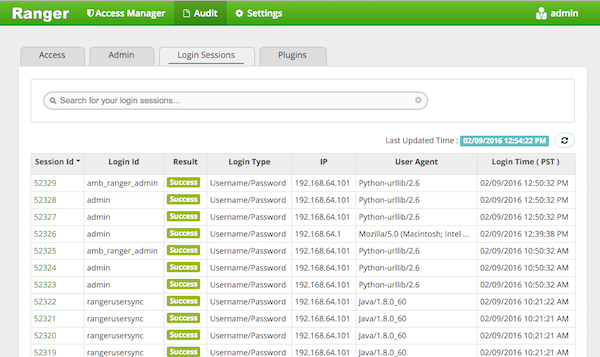 In Ranger, the Login Sessions tab logs the information related to the sessions for each login. Login ID The username through which someone logs in to the system. Session-id The session count increments each time the user tries to log into the system. Start Date, End Date Specifies that results should be filtered based on a particular start date and end date. Login Type The mode through which the user tries to login (by entering username and password). IP The IP address of the system through which the user logged in. Result Logs whether or not the login was successful. Possible results can be Success, Wrong Password, Account Disabled, Locked, Password Expired or User Not Found.